The Toronto Raptors had another “Drake Night” at Air Canada Centre on Wednesday, and it just so happened that they were playing host to the Golden State Warriors, the new home of Kevin Durant, a noted Drake friend and fan. But Durant was no friend or fan or groupie of Drake’s on Wednesday. He dropped 30 points, nine rebounds and six assists on 11-of-21 shooting, keying a Warriors comeback that almost became a shellacking. During Kevin Durant's postgame interview, @Drake gave him a little bump. At first read, you clearly think Durant is kidding. But then you listen to it, and he actually sounds kind of angry. A quick scan of Twitter will also show you that he and Drake were apparently jawing throughout the night. Friendly banter or words of (basketball) warfare? We may never know. Actually, fine. We probably will. 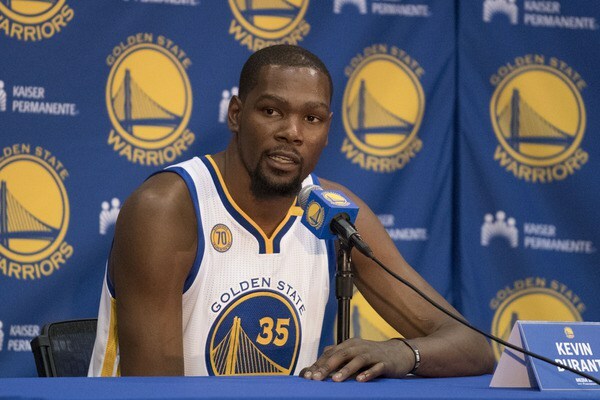 There will definitely be a followup question for Durant in the near future. If not before the Warriors’ next game, then most definitely ahead of the Dec. 28 matchup between these two at Oracle Arena. Until then, let’s assume Durant and Drake are still friends, but that when it comes to matters of wins and losses, Durant doesn’t give two craps about recognizing the existence of said friend.